This comes as no surprise to those of us that are rooted in this community where issues of the health of our communities and families are often top-of-mind around the dinner table. 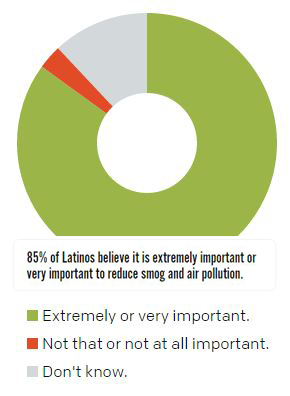 In reality, it also comes as no surprise to decision makers who have listened to our communities, and know Latinos have rich ties to the outdoors, but are too often the first and worst impacted by pollution. Luckily, several efforts are now in the works and will have significant positive impacts for Latino communities and the air they breathe. Efforts like the recently announced EPA methane rule, the Clean Power Plan, and the coming revision to ozone standards will all have positive impacts on air quality nationwide. These rules are especially important for Latinos, as nearly half the Latinos living in the United States lives in an area with unhealthy air quality. My home state of New Mexico serves as one example. The state is simultaneously home to a significant Hispanic population, experiencing expanding oil and gas development, and unfortunately in areas like the San Juan Basin, also experiencing unhealthy levels of ozone pollution. 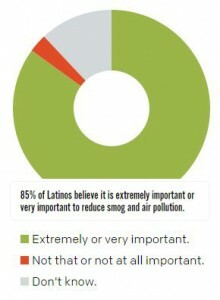 This same overlap between polluted air and Latino and Hispanic communities can be found again and again in many places including California and Colorado, as well as the Eagle Ford region in Texas. These areas stand to see significant reductions in oil and gas related air pollution under the new EPA methane rules and anticipated ozone standards. These common sense, health based standards make sense for Latinos and for all Americans. Please take a moment to thank EPA for these life-saving efforts to clean up our air. This entry was posted in Air Quality, California, Clean Energy, Clean Power Plan, Climate, Colorado, Methane, Natural Gas and tagged air quality, California, Clean Air, Clean Power Plan, Colorado, diversity, Latinos, Methane, Natural Gas, New Mexico. Bookmark the permalink. Both comments and trackbacks are currently closed. Lucía is the Campaign Manager for New Climate Partnerships and focuses on expanding EDF’s engagement with Latino communities. She manages national Latino engagement initiatives on climate change with EDF’s Political Affairs program, and supports inclusion and engagement efforts with diverse communities across the organization. 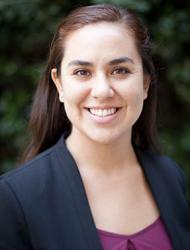 Lucía first joined EDF as a Tom Graff Diversity Fellow.